LINDSTRÖM GROUP, A FINNISH MULTINATIONAL B2B TEXTILE PROVIDER, SIGNIFICANTLY INCREASED THEIR SALES BY VISUALIZING THEIR PRODUCTS FOR THEIR CUSTOMERS. No more dragging textiles around to customers who won’t get an idea of the final look from just a tiny piece of fabric anyway. From now on, Lindström salespeople will have the entire product range at their fingertips – and with just a few clicks are able to show the entire selection on the customer’s own premises. Lindström first tried LiveDesign in Finland. The results were so promising that the company quickly decided to expand the tool to other markets. ”“VividAR has positively affected our sales. When a customer can see the right mats in the right surroundings, it’s much easier for them to place an order. Since then, Lindström has launched LiveDesign in seven other European countries. According to Satu Haikarainen, more countries are set to follow. The company will also be using LiveDesign for other products. In addition to helping the customer visualize the mats ‘in situ’, Lindström has noticed other major benefits. Sales processes have been accelerated and salespeople have gained more credibility. 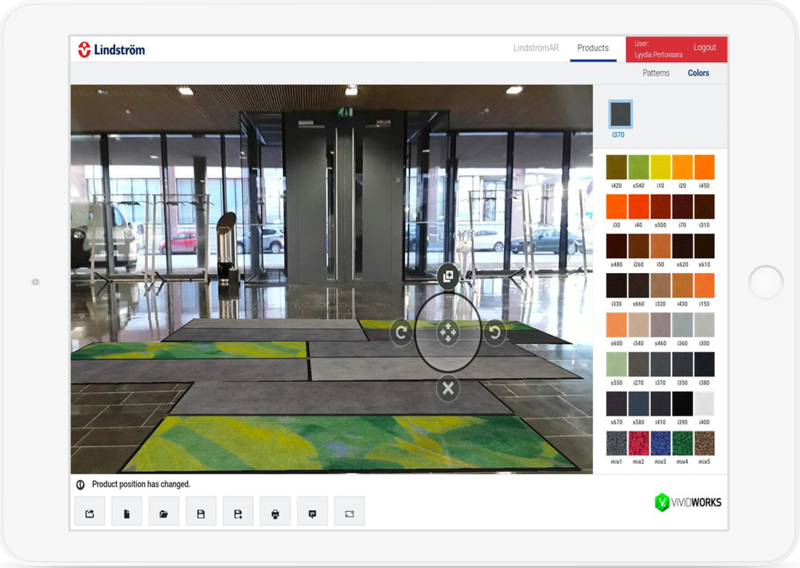 With the LiveDesign tool, the full range of mats is instantly visible anywhere and by any salesperson.